« Guess who’s hiding inside…? As a surprise follow-up to the truly wonderful BBQ gathering this past weekend (Richard promises pics and vids SOON), it looks like a local panel I’ll be giving will be broadcast live online tonight! Just click on the link around 6:30PM Pacific Standard time and follow the tabs to Live Webcasts/Netcasts…you’ll need the newest Quicktime to view. 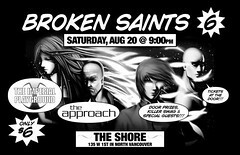 THE TRULY FINAL BS ROCK BASH – BROKEN SAINTS ‘6’ – WILL BE COMING FULL CIRCLE ON SATURDAY, AUGUST 20th @ THE SHORE in NORTH VANCOUVER! More news to follow in the next mailer and on the blog, but if you can make it to Van in 3 weeks, you WON’T be disappointed. This promises to be something special! More soon, baboons…much love from here to there. This entry was posted on Monday, July 25th, 2005 at 11:06 pm and is filed under Uncategorized. You can follow any responses to this entry through the RSS 2.0 feed. You can leave a response, or trackback from your own site.